Berenice Abbott was born in Springfield, Ohio and attended Ohio State University with the intention of becoming a journalist. In 1918, however, she moved to Greenwich Village in New York City, and from there traveled to Europe, where she studied sculpture under Brancusi and Bourdelle. From 1923 to 1925, she worked as a darkroom assistant to Man Ray in Paris. In 1926, she opened her own portrait studio there. She was a friend of modernists and ex-patriate artists, including Djuna Barnes. Berenice Abbott's work came to be exhibited alongside that of Man Ray, André Kertész, and others in the Premier Salon Indépendant de la Photographie in Paris, and was acquired by the Art Institute of Chicago, the Smithsonian Institution, and many other museums and galleries. In 1929, she returned to the USA and continued to practice photography until 1934, when she began to teach. She never married and was the lifetime companion of art historian Elizabeth McCausland. She promoted and curated the work of the French photographer Eugene Atget, whom she admired, bought his photos and placed them in the Museum of Modern Art in New York. Her books included Changing New York (1939), The View Camera Made Simple (1948), and The World of Atget (1964). 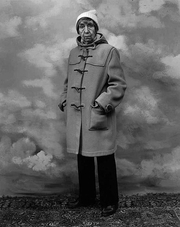 Berenice Abbott is currently considered a "single author." If one or more works are by a distinct, homonymous authors, go ahead and split the author. Berenice Abbott is composed of 6 names. You can examine and separate out names.